HockeyPucks hiking and highpointing: Nahor Hill - Antrim - 1170 Ft.
From route 202 in Bennington turn onto Pierce Hill (Verney Rd) and follow it 1.1 miles to the merge with N Rd. Continue on N Rd for 0.1 miles to the intersection. Park on the side of the road the trailhead is the class VI road opposite N Rd. Follow the class 6 road as it gradually ascends along a stone wall reaching the unnamed "Greystone Pond" at 0.4 miles. You'll find the skeleton of an old dock protruding into the uninviting pond. The road bends and grade increases for a short distance then becomes more gradual as you continue another 0.65 miles to the summit. There are limited views and no official markings on the summit. 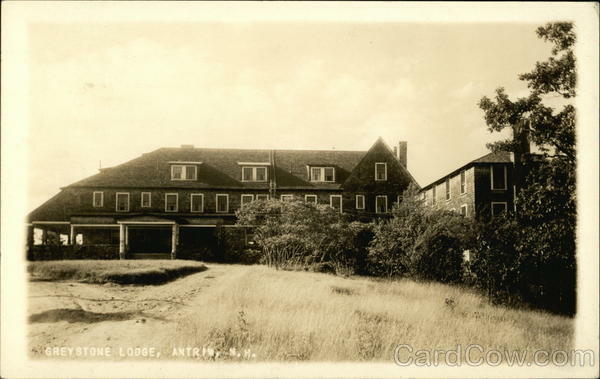 The summit was once home to the luxurious resort known as Greystone Lodge. There is little but some rock walls and a foundation with rock fireplace, and a few appliances remaining of the once upscale vacation resort. Greystone Lodge was built in 1913 as a mountaintop summer resort. 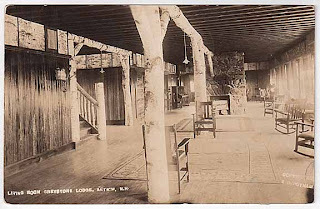 The lodge operated successfully until the mid 1930-s when it passed in to hands of private investor after private investor. It fell into a state of dis-repair in the early 1970's and all that is left of the glamorous hotel is a stone foundation, chimney and a variety of appliances. There appears to be the stone remains of a parking area as well as a large boulder with a hole and tooling ebedded into it's surface near the summit. 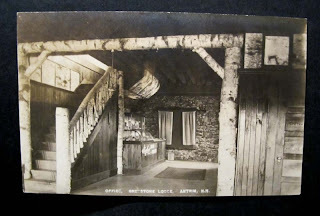 Unfortunately I didn't bring my camera on the hike however I did find some post card images on E-bay of Greystone Lodge as it appeared in the 1920's. My grandparents owned this from about 1948 to 1957. I loved going there in the summer when I was a child. Thanks for the memories. When they owned it, there were clear views all around and they had a beautiful rock garden in the back. Great feedback. Nahor hill certainly has it's history and it's unfortunate to see it in the current neglected state. I would have enjoyed visiting the location in it's prime. I'm surprised there isn't more information on this place. I've been up there several times recently as NH history is a hobby of mine. found a few pictures on line but not much else. We would hike up to Greystone Lodge in the 1960's as teenagers and explore through the building and grounds. The pictures bring back so many memories! I dreamed of owning it some day and fixing it up. I remember quite vividly the day it burned (in 1970? ), seeing all the black smoke and realizing it was gone.